Ditalini and I recently joined a produce co-op. Every Saturday we pick up two good-sized baskets of seasonal vegetables and fruit. 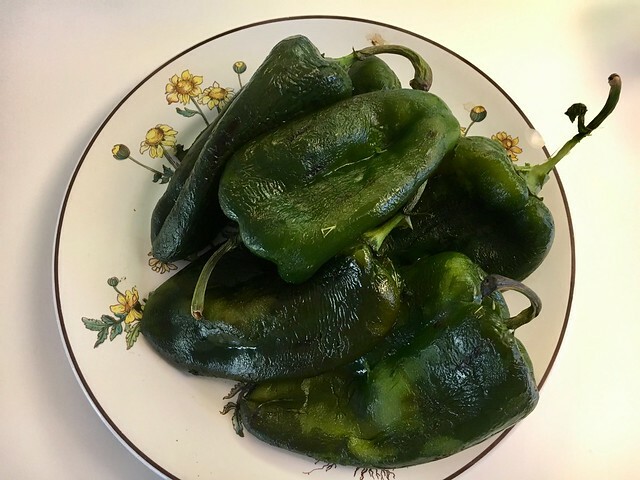 This Saturday we found eight big green chiles mixed in with our haul, and Ditalini decided to make chiles rellenos from scratch. 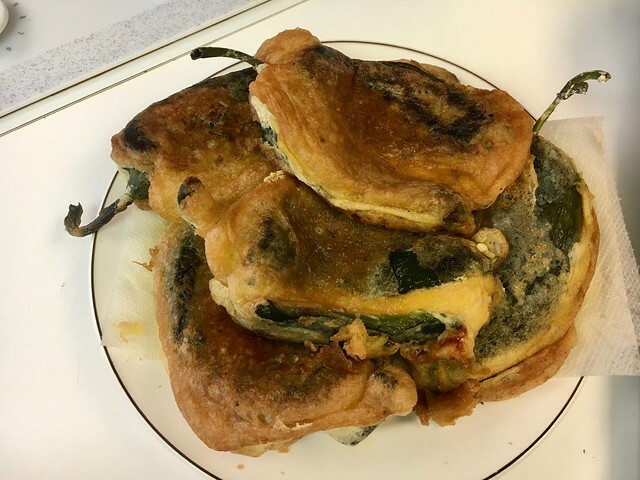 We used to make chiles rellenos using Ortega canned green chiles, but these turned out firmer and tastier than the canned kind, so we’re staying with fresh chiles from now on. It’s a little harder using fresh peppers, because you have to get rid of the skin first (canned ones come prepared) … but the extra effort is worth it. Roast the chiles until the skin is blistered (you can do this over a fire or in the broiler, turning the chiles to blister the skin all around), then peel off the skin. Slice each chili lengthwise and scrape out the seeds. Place a couple of slices of cheese inside each chili, then roll the chiles in flour. Separate the yolks and whites of the eggs. Beat the egg whites until they peak, then beat in the yolks. Dip each chili in the batter and fry in hot oil until golden brown. Place on a paper towel on a warm platter and keep in a warm oven. For the sauce, fry the onion in butter or oil until soft. Crush tomatoes with a mortar and pestle, add to onions. Add chicken broth to desired liquid consistency (we use about half a can), season with salt and pepper, let cook about five minutes. Serve with Spanish rice, refried beans, and warm tortillas. © 2018, Crouton deMenthe. All rights reserved. 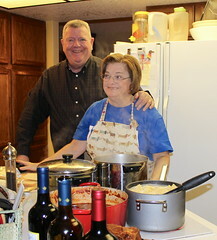 About Crouton deMenthe Amateur cook and barbecue fanatic.